The stubble and straw remaining in grass seed fields after harvesting seed is known as residue. Management of the post-harvest residues is an important practice in grass seed production. Crops residues are managed in grass seed fields for control of certain diseases and weeds, to stimulate seed yield in some species of grasses, to remove large volumes of straw and stubble that might interfere with crop management operations, and to recycle nutrients in grass seed fields. A broad range of grass species are grown for seed production in Oregon – these species differ markedly in their seed yield response to post-harvest residue management. 1. Thermal. This method includes fire-based straw and stubble removal and includes field burning with full straw load in place on the field (open-field burning) and propane burning. In some instances, straw is removed from the field and burned in stacks. Field burning has been an effective, economical and controversial method of crop residue removal and pest control in grass seed crops for more than 50 years. 2. Clean non-thermal. This method is based on straw removal by baling, and removal from the field. Stubble reduction following straw removal with a flail mower may or may not be employed. Straw removed from grass seed fields is used for animal feed, especially for export markets, as well as other products. The straw removed from seed fields has potential for use a feedstock for the production of ethanol biofuel. 3. Full straw load. This method involves no straw removal as the straw is allowed to decompose in the field. Straw length may be reduced by flail mower and/or by combine straw chopper. The straw composts in place in the seed field thereby improving several beneficial characteristics of the soil. 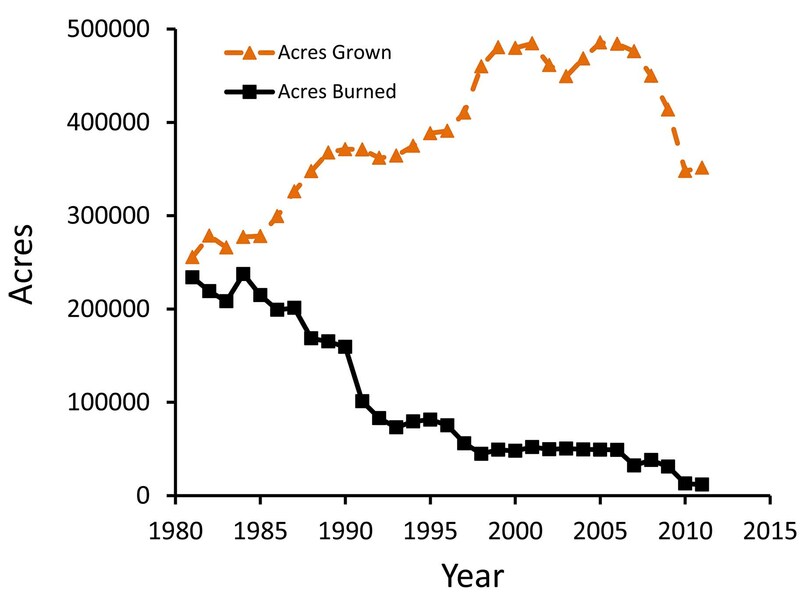 Since 1980, grass seed growers have reduced the practice of open-field burning in the Willamette Valley from the predominant residue management method to a method that is used on about 10% of the grass seed crop acreage for the past 10 years. This reduction has taken place even as the acreage of grass seed crops has reached record levels of production. The purpose of this page is to provide a bibliographic summary of relevant works published on the topic of post-harvest residue management in grass seed crops. Chastain, T.G., W.C. Young III, and G.L. Kiemnec. 1994. Thermal and nonthermal residue management for cool-season grass seed crops. Proc. of the 43rd Oregon Society of Weed Science Annual Meetings. 43:14-17. Chastain, T. G., W. C. Young III, C. J. Garbacik, and B. M. Quebbeman. 1995a. Post-harvest residue management for perennial ryegrass seed crops. Agron. Abstr., American Society of Agronomy, Madison, WI. p. 142. Chastain, T.G., G.L. Kiemnec, G.H. Cook, C.J. Garbacik, and B.M. Quebbeman. 1995b. Residue management practices for grass seed crops grown in the Grande Ronde Valley. In W.C. Young III (ed.) Seed Production. Oregon State Univ., Crop Sci. Ext. Rep. 102:8-10. Chastain, T.G., W.C. Young III, C.J. Garbacik, B.M. Quebbeman, G.A. Gingrich, M.E. Mellbye, and S. Aldrich-Markham. 1996a. Residue management options for Willamette Valley grass seed crops. In W.C. Young III (ed.) Seed Production. Oregon State Univ., Crop Sci. Ext. Rep. 106:1-5. Chastain, T.G., G.L. Kiemnec, G.H. Cook, C.J. Garbacik, B.M. Quebbeman, and F.J. Crowe. 1997a. Residue management strategies for Kentucky bluegrass seed production. Crop Sci. 37:1836-1840. Chastain, T.G., W.C. Young III, G.L. Kiemnec, C.J. Garbacik, G.A. Gingrich, and G.H. Cook. 1997b. Post-harvest residue mangement for fine fescue seed crops in Oregon. Proc. 18th Intl. Grassland Congress. 25:55-56. Chastain, T.G., and W.C. Young III. 1998. Vegetative plant development and seed production in cool-season perennial grasses. Seed Science Research 8:295-301. Chastain, T.G., and W.C. Young III. 1999a. Post-harvest residue management: Species, stand age, and technique affects grass seed yield. Proc. 4th International Herbage Seed Conference. 4:152-156. Chastain, T.G., W.C. Young III, G.L Kiemnec, C.J. Garbacik, G.A. Gingrich, and G.H. Cook. 1999b. Post-harvest residue management for fine fescue seed crops in Oregon. p. 55-56 (session 25). In J.G. Buchanan-Smith et al. (ed.) Proc. XVIII International Grassland Congress, Winnipeg and Saskatoon, Canada. 8-17 June 1997. Association Management Centre, Calgary, Canada. Chastain, T.G., W.C. Young III, C.J. Garbacik, P.D. Meints, and T.B. Silberstein. 2000. Alternative residue management and stand age effects on seed quality in cool-season perennial grasses. Seed Tech. 22:34-42. Chastain, T.G., C.J. Garbacik, T.B. Silberstein, and William C. Young III. 2011. Seed production characteristics of three fine fescue species in residue management systems. Agron. J. 103:1495-1502. Chilcote, D.O., H.W. Youngberg, P.C. Stanwood, and S. Kim. 1980. Post-harvest residue burning effects on perennial grass development and seed yield. In Hebblethwaite, P.D. (ed.) Seed production. London, Butterworths. pp 91-103. Chilcote, D.O., and W.C. Young III. 1991. Grass seed production in the absence of open-field burning. Journal of Applied Seed Production. 9:33-37(supplement). Coats, D. D., W. C. Young III, and F. J. Crowe. 1994. Evaluation of post-harvest residue removal equipment on Kentucky bluegrass grown for seed in Central Oregon. p. 177. In Agronomy abstracts. ASA, Madison, WI. Diebel, P. L., L. R. Gow, and D. L. Walenta. 2009. An Economic Comparison of Alternative Bluegrass Residue Management Practices in Oregon’s Grande Ronde Valley. OSU Experiment Station Special Report 1090. Garbacik, C.J., T. G. Chastain, W.C. Young III, and T.B. Silberstein. 1997. Residue management techniques for dryland bentgrass seed fields in Oregon. Western Society of Crop Science, Agron. Abstr. American Society of Agronomy, Madison, WI. p. 6. Hardison, J.R. 1980. Role of fire for disease control in grass seed production. Plant Disease 64:641-645. Lee, W. O. 1974. Field burning effects on weed control in grass seed crops. Oregon State University Research on Field Burning, Circ. Info. 647, Agric. Exp. Sta., Oregon State Univ., December 1974, p. 40-43. Meints, P.D., T.G. Chastain, W.C. Young III, G.M. Banowetz, and C.J. Garbacik. 2001. Stubble management effects on three creeping red fescue cultivars grown for seed production. Agron. J. 93:1276-1281. Mueller-Warrant, G.W. and S.C. Rosato. 2002a Weed control for stand duration perennial ryegrass seed production: I. Residue removed. Agron. J. 94:1181-1191. Mueller-Warrant, G.W. and S.C. Rosato. 2002b Weed control for stand duration perennial ryegrass seed production: II. Residue retained. Agron. J. 94:1192-1203. Mueller-Warrant, G.W. and S.C. Rosato. 2005. Weed control for tall fescue seed production and stand duration without burning. Crop Sci. 45:2614-2628. Mueller-Warrant, G.W., W.C. Young III, T.G. Chastain, and S.C. Rosato. 2007. Residue management and herbicides for downy brome (Bromus tectorum) control in Kentucky bluegrass grown for seed. Weed Tech. 21:411-421. Pumphrey, F.V. 1965. Residue management in Kentucky bluegrass (Poa pratensis L.) and red fescue (Festuca rubra L.) seed fields. Agron. J. 57:559-561. Steiner, J.J., S. M. Griffith, G. W. Mueller-Warrant, G. W. Whittaker, G. M. Banowetz, and L. F. Elliott. 2006. Conservation practices in western Oregon perennial grass seed systems: I. Impacts of direct seeding and maximal residue management on production. Agron. J. 98:177-186. Young III, W. C., H. W. Youngberg, and D. O. Chilcote. 1984. Post-harvest residue management effects on seed yield in perennial grass seed production. I. 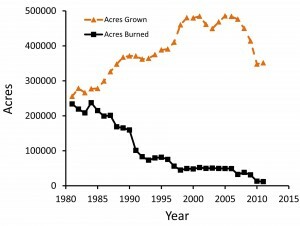 The long-term effect from non-burning techniques of grass seed residue removal. J. Appl. Seed Prod. 2:36-40. Young III, W.C., T.G. Chastain, M.E. Mellbye, C.J. Garbacik, and B.M. Quebbeman. 1996. Crop residue management and establishment systems for annual ryegrass seed production. In W.C. Young III (ed.) Seed Production. Crop Sci. Ext. Rep. 106:23-25. Young, W.C. III, T.G. Chastain, M.E. Mellbye, C.J. Garbacik, and B.M. Quebbeman. 1997. Residue management and establishment systems for annual ryegrass seed production. Proc. 18th Intl. Grassland Congress. 25:37-38. Young III, W.C., G.A. Gingrich, T.B. Silberstein, and B.M. Quebbeman. 1998a. Post-harvest residue management of creeping red and Chewings fescue seed crops. Agron. J. 90:69-73. Young III, W.C., H.W. Youngberg, and T.B. Silberstein. 1998b. Management studies on seed production of turf-type tall fescue: I. Seed yield. Agron. J. 90:474-477. Young III, W.C., H.W. Youngberg, and T.B. Silberstein. 1998c. Management studies on seed production of turf-type tall fescue: I. Seed yield components. Agron J. 90:478-483. Young III, W.C., M.E. Mellbye, and T.B. Silberstein. 1999. Residue management of perennial ryegrass and tall fescue seed crops. Agron. J. 91:671-675. Zapiola, M. L., T. G. Chastain, C. J. Garbacik, T. B. Silberstein, and W. C. Young III. 2006. Trinexapac-ethyl and open-field burning maximize seed yield in creeping red fescue. Agron. J. 98:1427-1434. Ensign, R.D., V.G. Hickey, and M.D. Bernardo. 1983. Seed yield of Kentucky bluegrass as affected by post-harvest residue removal. Agron J. 75:549-551. Hickey, V. G., and R. D. Ensign. 1983. Kentucky bluegrass seed production characteristics as affected by residue management. Agron. J. 75:107-110. Holman, J.D. C. Hunt, J. Johnson-Maynard, L. VanTassell, and D. Thill. 2007. Livestock use as a non-thermal residue management practice in Kentucky bluegrass seed production systems. Agron. J. 99:203-210. Lamb, P.F., and G.A. Murray. 1999. Kentucky bluegrass seed and vegetative responses to residue management and fall nitrogen. Crop Sci. 39:1416-1423. Murray, G. A., and J. B. Swensen. 1994. Panicle expression and seed yield of Kentucky bluegrass with mechanical residue removal. p.138. In Agronomy abstracts. ASA Madison, WI. Sylvester, A.W., and J.O. Reynolds. 1999. Annual and biennial flowering habit of Kentucky bluegrass tillers. Crop Sci. 39:500-508. Canode, C.L. 1972. Grass seed production as influenced by cultivation, gapping, and postharvest residue management. Agron. J. 64:148-151. Canode, C.L., and A.G. Law. 1978. Influence of fertilizer and residue management on grass seed production. Agron. J. 70:543-546. Canode, C.L., and A.G. Law. 1979. Thatch and tiller size as influenced by residue management in Kentucky bluegrass seed production. Agron. J. 71:289-291. Johnson, R.C., W.J. Johnston, and C.T. Golob. 2003. Residue management, seed production, crop development, and turf quality in diverse Kentucky bluegrass germplasm. Crop Sci. 43:1091-1099.